Shown below is one design for an analogue spectrum analyser. Choice of the intermediate frequencies will depend on the input frequency range as the first mixer will normally be an up-conversion process so IF1 will always be above the input frequency. For microwave applications a third conversion process will be required. The second IF will also depend on the availability of tuned circuits, crystals and ceramic resonators with which to construct the various filters. The crystals and resonators should have a minimum number of close-in spurious responses and the crystals can be obtained by disassembling mobile radio IF filters that use discrete crystals. VCO1 is a wide range voltage controlled oscillator. VCO2 is a narrow frequency range voltage controlled oscillator. Both VCOs should have the lowest possible sideband noise levels. In wide scan modes, VCO1 is used for scanning and VCO2 for fine tuning. In narrow scan modes, VCO1 is phase locked to a harmonic of a local crystal controlled frequency source, say 1Mhz, and VCO2 is used for scanning. There is a fixed relationship between scan width, scan speed, IF and video bandwidths and the bandwidth of the item being measured. If this relationship is exceeded then the displayed signals will suffer slew rate distortion as the system cannot respond sufficiently quickly. Slow scan rates will also be required when testing external narrow bandwidth filters. An oscilloscope may be used for the display of the X and Y signals. An XY display may also be used if the deflection frequency responses are sufficiently high. The block diagram below shows a simple analogue tracking generator to match the spectrum analyser above. This will produce an output signal at the frequency to which the analyser is tuned. 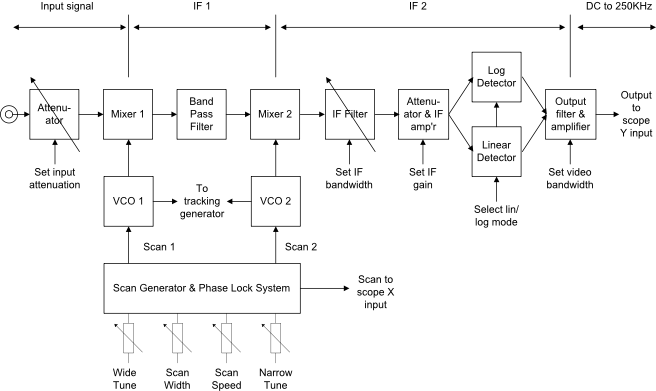 The isolation between the analyser and the tracking generator must be sufficiently high so that the tracking generator output cannot be seen on the analyser display when not connected. This means significant effort must be expended on internal screening and decoupling. The output of the tracking generator will typically be at least +10dBm in 50ohms.